Loganiaceae. Zones 5b-10. This is a native of the southeastern to southern midwestern United States. 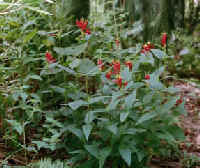 Produces stiff, erect stems to two and a half feet tall with opposite lanceolate foliage. The real show comes in July to September when the terminal cymes of upright flowers appear. Blooms are tubular with a carmine red exterior and a bright yellow interior. Truly elegant! Although this plant is native to shaded woodland areas, it will also thrive in full sun with a moist, organically enriched, well-drained soil. We recommend morning sun/afternoon shade in the warmer zones. Attracts hummingbirds.